Prepare to beam yourself up! 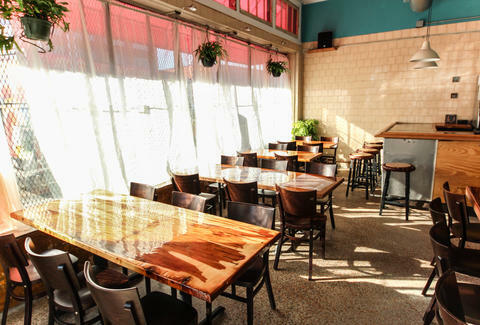 Then, when you're done drinking that fine, affordable bourbon, walk into Mothership, which serves an eclectic array of Caribbean-influenced dishes in a casual Park View corner spot with a bit of a deli feel thanks to subway tile and butcher's block communal table. They've even got laminated blueprints of their original, failed architectural drawings next to the city-approved $8000 versions. The food runs from oxtail, bone marrow & boniato mini patties (with spicy guava sauce) to roast pork/ Virginia ham/ pickles/ mustard Bechamel "Cuban pizzas", whose dough is kneaded much more expertly than in those knock-off Dominican pizzas.